The first few chapters of Possess did not draw me in. They felt a little rough around the edges and I was worried this was going to be another book that got high praise from others and left me baffled. Once the book got introductions and explanations over and could settle into the actual story, it got better. So much better. I was expecting a book that relied heavily on religion to make a point. For the first few chapters, it seemed like that would be the direction the book took. Thankfully, the religion aspects of the novel were secondary. The story focused more on Bridget as she came to terms with her father’s death, her seemingly new power, and a possible love interest. Bridget has the power to banish demons. She only recently discovered this power and it’s giving her a lot of self-doubt. She wasn’t looking for anything like this. She hasn’t really come to terms with the death of her father, plus she’s just like any normal teenage girl trying to find her way through the maze that is the high school years. She was a little immature at times, but that fit her character. I was happy she wasn’t some perfectly put together fifteen year old; she was a fifteen year old that had to grow up a little too fast, but she was still 15. Matt was sweet. He isn’t my favorite Young Adult love interest, but he was nice enough and made me smile. He works hard to get Bridget to see him as more than the annoying son of a cop and I’m glad he got through to her. I can see him being her strength when she needs it. The story wrapped up nicely, but left it open for more. It’s clear Possess is its own story, and I’m thankful for that. I’m also thankful the ending was left open for more. 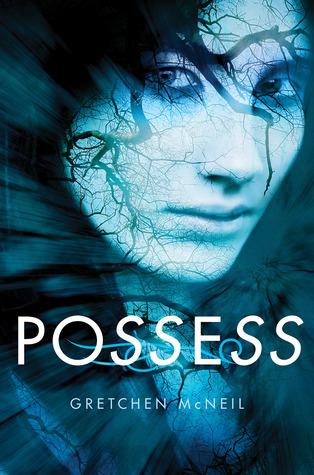 Possess is a book that surprised me. It got off to a slightly shaky start, but as soon as the action and mystery kicked in, it became a page-turner. This entry was posted in Something a Little Different, Young (and New) Adult and tagged Fantasy, Gretchen McNiel, Paranormal, Supernatural, Young Adult.